In the life and death business of EMS, you need tools that you can rely upon. Capnography is the non-invasive measurement of exhaled carbon dioxide (CO2) displayed as a CO2 waveform concentration over time. During the 1980s, capnography became a standard for anesthesia care in the U.S.  and is now becoming a standard of care in EMS, the emergency department and the ICU. While pulse oximetry mirrors oxygenation status, capnography reflects ventilation, perfusion, and metabolism. Available for both intubated and spontaneously breathing patients, and now a part of the EMT curriculum, capnography is an amazingly valuable tool and one you can most certainly rely on. Understanding the meaning and value of capnography begins with an appreciation of how carbon dioxide is generated in the body. Simply, our bodies use oxygen and water to make energy; carbon dioxide is the waste product of that process. In a steady state, CO2 production remains relatively consistent, hence measuring exhaled CO2 directly reflects ventilation. If perfusion declines for any reason, such as a drop in cardiac output or the onset of a shock state, the amount of CO2 being returned to the lungs will fall. Capnography will reflect that change. Nowhere is this more powerfully illustrated than during CPR. An EtCO2 of less than 10 mmHg during an arrest suggests that the chest compressions are not deep or fast enough, that the rescuer is tired (hence the reason we need to change compressor every two minutes), or that excellent CPR is not producing even minimal perfusion. There is a large volume of data suggesting that failure to achieve an end-tidal CO2 above 10 mmHg within the first 20 minutes of CPR is never associated with ROSC (return of spontaneous circulation) and could reasonably be used to terminate resuscitation. Finally, capnography reflects metabolism, and seems to be one of the earliest indicators of alterations in metabolic activity. In cardiac arrest, for example, a sharp rise in EtCO2 was determined to be the earliest indicator of return of spontaneous circulation (ROSC) in two prehospital studies. This increase in exhaled CO2 occurred significantly earlier than palpable pulses or blood pressure. [3,4] The same holds true in altered metabolic states such as diabetic ketoacidosis. As aerobic metabolism falls and the patient becomes more acidotic, exhaled CO2 will also fall. Capnography is available for both spontaneously breathing patients and patients who are receiving positive pressure ventilation. For patients who are breathing spontaneously, exhaled CO2[CL1] can be measured using a nasal cannula type device where one of the cannula prongs (and sometimes an additional collector positioned over the mouth) samples respiratory gases. For patients receiving positive pressure ventilation, CO2 is measured using an adapter placed at the connection between the ventilation device or circuit and the advanced airway or mask being used on the patient. In patients receiving non-invasive ventilation (NIV) such as CPAP or BiPAP, washout of CO2 caused by the high flows associated with NIV readily interferes with accurate CO2 measurement when sampled from any location besides the nasal oral site (using a cannula type device mentioned previously). [5-7] This would not be the case with bag-valve-mask ventilation of an apneic or profoundly distressed patient. Recently, a miniature in-line capnography device that includes a waveform has received FDA approval and could serve as an ideal device for measurement of EtCO2 by both BLS and ALS providers when ventilating apneic patients or assisting ventilations in patients with respiratory failure. It is worthwhile to review the components of the capnography waveform as an understanding of how the components of a normal capnography help providers to recognize and drill down the physiologic changes that alter CO2 waveforms. Figure 1 illustrates a typical capnography waveform. Notice that the height of the waveform corresponds to the amount of exhaled CO2 and the length of the waveform represents time; the taller the waveform, the higher the exhaled CO2 value; the shorter the duration of the waveforms, the faster the respiratory rate. Note that inspiration is associated with a rapid drop in CO2 concentration back to a zero baseline. Expiration initially continues along this zero baseline as the typical 50 to 150 cc of dead space is expelled from the airways. This is followed by a rapid rise in exhaled CO2 as exhalation of alveolar air occurs. The peak, or point immediately preceding inspiration is the spot at which the end-tidal (or end of breath) CO2 value is obtained. Note the relatively minimal upward slope of the expiratory phase; this is referred to as the alveolar plateau. It represents alveolar gases being exhaled. Several pathological conditions reveal themselves in alterations of the normally relatively square-shaped capnogram. Inspiration is observed by a sharp decline in the waveform. The exhalation phase of the capnogram exhibits a marked rise in CO2 concentration, eventually reaching a plateau. In normal exhalation, the alveolar plateau will range from relatively flat to a slight upward angle. In patients with bronchoconstriction, exhalation is impaired, resulting in a more pronounced angle rather than the normally seen alveolar plateau. The degree of this upward angling of the capnogram correlates to the severity of the bronchoconstriction or air trapping. This waveform is often described as “shark fin”–like in appearance. With appropriate treatment, providers will see the capnogram’s alveolar plateau return. Use of capnography to monitor CPR quality and detect ROSC should be done initially by attaching an EtCO2 monitoring device to the bag-valve-mask device. Once an advanced airway is placed, capnography serves the added purpose of assuring that the airway remains in place. Resuscitation involves maximal patient movement and offers considerable opportunity for airway displacement. In fact, the degree of patient movement seen in any patient transport, both in and outside the hospital, is significant enough to cause unrecognized airway displacement. Continuous waveform capnography is a standard of care in any patient transport environment[CL3] . The utility of capnography in detecting ROSC serves an added purpose of monitoring perfusion and metabolism post-arrest. Once ROSC is achieved, capnography provides the earliest indicator of deterioration in perfusion. A falling EtCO2 signals the resuscitation team that the patient is re-arresting. 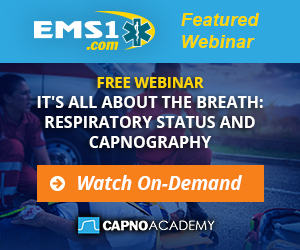 Capnography serves an additional role of allowing providers to control assisted ventilation. For post-arrest patients and head injury patients with suspected increases in intracranial pressure (ICP), control of ventilation can critically affect outcomes. In head injured patients, for example, sustained arterial CO2 levels of 50 mmHg or greater increase blood flow to the brain, thereby raising ICP. Low sustained CO2 levels of 30 or less also worsen neurological outcomes. As EtCO2 reflects arterial CO2 in patients with reasonable perfusion, capnography is a valuable tool for avoiding inadvertent hyper- or hypoventilation. Capnography discussions often overlook the many valuable uses this technology offers when treating awake and spontaneously breathing patients. In fact, there are frequent opportunities to affect patient outcomes by routine use of capnography on the wide variety of EMS patients we encounter every day. One of the most obvious and routine uses for capnography is in assessment of patients who appear to be critically ill. The waveform and EtCO2 values provide ready information not only about breathing but perfusion as well. Normal EtCO2 values range from 35 to 45 mmHg. A critically ill–appearing patient with a normal capnography waveform and EtCO2 value has a patent airway, is breathing adequately and has reasonable perfusion. In hypoperfused patients with metabolic acidosis from shock states, EtCO2 decreases because of a compensatory increase in minute volume resulting from a decrease in serum bicarbonate (HCO3). The more acidotic the patient becomes, the lower the serum HCO3, the greater the respiratory rate, and the lower the EtCO2. Interestingly, while not well documented, capnography waveforms often become blunted, taking on a more rounded appearance, in low cardiac output states. Visualizing such a waveform, accompanied by a low EtCO2 value, strongly suggests an element of cardiogenic compromise. Capnography then, becomes a stellar tool for detecting metabolic acidosis, diabetic ketoacidosis, lactic acidosis seen in sepsis or cyanide poisoning, pulmonary embolus and simple hypoperfusion resulting from any shock state. Capnography also allows a provider to differentiate between sick (metabolic acidosis resulting in increased respiratory rate and decreased EtCO2) versus not so sick (nonacidotic with normal respiratory rate and normal EtCO2). [12,13] This can be particularly helpful in assessing pediatric patients with gastroenteritis, where the degree of dehydration is often very difficult to determine. Patients in seizure often confound assessment. Capnography can readily determine if a seizing patient is apneic or breathing and whether their breathing is effective or ineffective. In patients with acute respiratory distress, waveform capnography helps to assess the degree of airway flow obstruction and (numerically) illustrates the effectiveness of ventilation. Response to treatment can be seen by return of the capnography waveform to a more normal shape, whereas deterioration and tiring are evidenced by a climbing EtCO2 — values above 70 mmHg in patients without COPD strongly suggest respiratory failure, necessitating assisted ventilation. Any time you sedate a patient (for cardioversion, management of aggressive behavior, pacing, etc.) or administer narcotics for pain, capnography should be used to monitor for respiratory depression. Falling oxygen saturation is far too late of an indicator that your patient is not breathing adequately! Finally, capnography is not subject to interference from excessive motion or low perfusion. We have all seen patients with such poor peripheral perfusion or continuous movement that no pulse oximeter is able to obtain a reliable signal. Capnography will work in these situations and may provide as much, if not more, information about perfusion, ventilation, and metabolism than you would ever get from a pulse oximeter. This could explain why many anesthesia providers today believe the capnography is the best vital sign. 1. American Society of Anesthesiologists: Standards for basic anesthetic monitoring. 2011; . (Accessed on January 8, 2014). 2.Canitneau JP. End-tidal carbon dioxide during cardiopulmonary resuscitation in humans presenting mostly with asystole, Crit Care Med 1996; 24:791-796. 3.Wayne MA, Levine RL, Miller CC. Use of end-tidal carbon dioxide to predict outcome in prehospital cardiac arrest. Ann Emerg Med. 1995; 25:762-767. 4.Levine RL, Wayne MA, Miller CC. End-tidal carbon dioxide and outcome of out-of-hospital cardiac arrest. NEJM. 1997; 337:301-306. 5.Nuccio PF, Hochstetler G, and Jackson M. End-tidal CO2 with noninvasive ventilation. Journal of the International Anesthesia Research Society 2007;105:S111. 6.Nuccio PF, Hochstetler G, and Jackson M. End-tidal CO2 measurements with noninvasive ventilation. Innovations and Applications of Monitoring Oxygenation & Ventilation (IAMOV) International Symposium at Duke University 2007. 7.Defilippis V, D’Antini D, Cinnella G, Dambrosio M, Schiraldi F, Procacci V. End-tidal arterial CO2 partial pressure gradient in patients with severe hypercapnia undergoing noninvasive ventilation. Open Access Emergency Medicine. 2013; 5:1-7. 8.Neumar RW, Otto CW, Link MS, Kronick SL, Shuster M, Callaway, CW, Kudenchuk PJ, Ornato JP, McNally B, Silvers SM, Passman RS, White RD, Hess EP, Tang W, Davis D, Sinz E, Morrison LJ. Part 8: adult advanced cardiovascular life support: 2010 American Heart Association Guidelines for Cardiopulmonary Resuscitation and Emergency Cardiovascular Care. Circulation. 2010;122(suppl 3):S729 —S767. 9. Helm M, Schuster R, Hauke J, Lampl L. Tight control of prehospital ventilation by capnography in major trauma victims. Br J Anaesth 2003; 90:327. 10. Weil MH, Bisera J, Trevino RP, Rackow EC. Cardiac output and end-tidal carbon dioxide. Crit Care Med 1985; 13:907. 11. Kartal M, Eray O, Rinnert S, et al. ETCO: a predictive tool for excluding metabolic disturbances in nonintubated patients. Am J Emerg Med 2011; 29:65. 12. Solmeinpur H, et al. Predictive Value of Capnography for Diagnosis in Patients with Suspected Diabetic Ketoacidosis in the Emergency Department. West J Emerg Med 2013; (www.escholarship.org/uc/item/5qz744fv). 13. Hunter CL, Silvestri S, Dean M, et al. End-tidal carbon dioxide is associated with mortality and lactate in patients with suspected sepsis. Am J Emerg Med 2013; 31:64. 14. Burton JH, Harrah JD, Germann CA, Dillon DC. Does end-tidal carbon dioxide monitoring detect respiratory events prior to current sedation monitoring practices? Acad Emerg Med 2006; 13:500.